Both Nebraska and Wisconsin are still in the race to with the West division of the Big Ten conference. That alone makes Saturday an interesting matchup. If the Huskers win, it's essentially a done deal (pending any major disasters). If Wisconsin wins, they'll hold the tie breaker if Nebraska loses another game before the end of the season. Needless to say, the road to the Big Ten Championship might just go through Madison on Saturday. To get a better understanding of what Nebraska is up against in Madison, we reached out to Jake Kocorowski of Bucky's 5th Quarter. He provided insight on how both teams could win, the crowd level at Camp Randall and the highly-debated rivalry discussion between Nebraska and Wisconsin. Q: How can Nebraska defeat Wisconsin? JK: I think it comes down to three things: working to establish the run on offense, taking advantage of Wisconsin's red zone woes and creating turnovers on defense. Nebraska averages over 211 yards rushing per game, while UW is tenth in the nation in rush defense (allowing only 103 per game). Wisconsin held an Iowa offense averaging 180 yards per game on the ground to 83 last week without sophomore nose guard Olive Sagapolu (right arm), but the defense took a substantial blow with the loss of inside linebacker Jack Cichy for the season with a torn pectoral muscle. Cichy, a former walk-on, leads the team in tackles (60), is second on the team with tackles for loss (seven) and had a relentless energy and closing speed to the ball carrier. In his place, another former walk-on, Ryan Connelly should take his place admirably, as he did for Chris Orr in the season opener against LSU (seven tackles). I don't expect much drop off with this defense and its cliched but very true "next man up" mantra, but if Nebraska can get something going with the interior of the defense losing its depth, it could be a long night for the Badgers. The Wisconsin offense has been inconsistent in its running game, though it's fared much better in recent weeks against Ohio State and Iowa (236 and 167 yards, respectively). If the Huskers can contain the Badgers' offense on first and second down, it could force redshirt freshman Alex Hornibrook to air it out on third and longs. That could be highly beneficial for Nebraska, who has intercepted 13 passes already this season, including two pick-sixes. UW's had trouble punching it in the red zone, only scoring on 21-of-28 possessions. That is good for 112th in the nation. Goal line fumbles against Georgia State and Iowa hurt their chances to extend leads that would have made those games far more comfortable than they were. Against Ohio State, they didn't punch touchdowns in and had to settle for field goals in their disappointing 30-23 overtime loss. If the Huskers bend but don't break in this area, they're in good shape. Q: How can Wisconsin defeat Nebraska? JK: Defensively, they need to keep doing what's made them so impressive this season: stop the run and make teams one dimensional. Tommy Armstrong has only completed 55 percent of his passes, but has rushed for 380 yards at a 4.7 yards per carry clip. If Justin Wilcox's squad, led by outside linebacker, team captain and mullet enthusiast Vince Biegel, can stop Armstrong and Terrell Newby, expect pressure being drawn up in key passing situations. Redshirt junior outside linebacker T.J. Watt leads the team in sacks with seven, and they've shown some nice corner and safety blitzes early on this season. I think the edge goes to Wisconsin here. On offense, it's really the story Chryst has stressed all year -- convert on third down and take advantage of red zone opportunities. I think that includes getting the running game going early and often. Senior running back Corey Clement ran for 134 yards last week against Iowa and 164 against Ohio State, and the jet sweep with either Jazz Peavy or true freshman A.J. Taylor has helped keep defenses honest. Despite the line utilizing multiple combinations this season, most notably against Iowa, there are some pieces being put together. Can they coalesce further into a more cohesive unit is the next step, but lots of credit needs to be given to offensive coordinator/offensive line coach Joe Rudolph on the work he's done with this position group. When they're in the red zone, they need to convert touchdowns instead of field goals. It's why Wisconsin turned to Alex Hornibrook instead of Bart Houston during the Georgia State game, though they missed key opportunities against the Buckeyes with the redshirt freshman under center. Goal line fumbles can't be squandered this week against the No. 7 team in the nation. Q: Nebraska fans remain concerned about injuries on the offensive line, what is the feeling among Badger fans about Wisconsin's injuries on defense? JK: It's concerning at linebacker and in the secondary, but more so the latter. Orr, who started opposite Cichy against LSU in the season opener, was lost for the season after the Tigers' first offensive play with a right knee injury. With Cichy, Connelly should be able to step in just fine and take over his role opposite redshirt sophomore T.J. Edwards as the two inside linebackers. There's also redshirt junior Leon Jacobs, who's switched back over to the position after moving to fullback in the spring. All have substantial game experience. I don't expect much drop off. At cornerback, Derrick Tindal suffered a right leg injury against the Hawkeyes and is currently listed as questionable heading into Saturday's game. Tindal and senior Sojourn Shelton have helped turn a question mark on the defense into a strength this year, with the help of defensive backs coach (and former walk-on, former All-American) Jim Leonhard returning to his alma mater. The third cornerback, Natrell Jamerson, has been out since the Georgia State game with a left leg injury, though he's been upgraded this week to questionable. If they don't go (although Tindal is expected to play), junior Lubern Figaro and redshirt freshman Titus Booker would step in like they did against the Hawkeyes last week. Even with those key injuries, Wisconsin held Iowa to 153 passing yards. Figaro's resurrected his career in Madison -- going from a true freshman starter at safety to almost forgotten defensive back last season, but has stepped up huge with his confidence back at corner in 2016. Booker's a former prep running back and appeared to hold up well in substantial action. The "next man up" mentality is real at Wisconsin, and so far the results have lived up to the moniker. Q: Sounds like the Badgers will play two quarterbacks again this week. Why bring that back last week? JK: It's definitely possible. Chryst has always mentioned both quarterbacks need to be ready for game action, and they called Houston's name on a couple of drives last week. Houston's a redshirt senior who's waited for his time after being a heralded recruit out of California. He possesses an NFL-caliber arm (see: the 17-yard touchdown pass to Troy Fumagalli last week) and a hint of mobility that was seen in some designed rollouts and that scramble for a first down against the Hawkeyes. He is prone to some mental errors, however (see: pick-six thrown against LSU). Hornibrook is the quarterback of the future for Wisconsin, and not going to Houston in its 14-7 loss at Michigan (159 total offensive yards) shows they feel that way. Hornibrook provides a different dynamic than Houston with the ability to throw an accurate deep ball, as seen last week with the 57-yard reception by true freshman Quintez Cephus. His arm's definitely not like Houston's, but he's shown able to drive the ball down the field as the leader of that offense. Chryst mentioned on Monday that he feels those two players can help give the team the best chance to win. He did say, however, that "We'll figure it out." It's still a fluid, game-to-game situation. 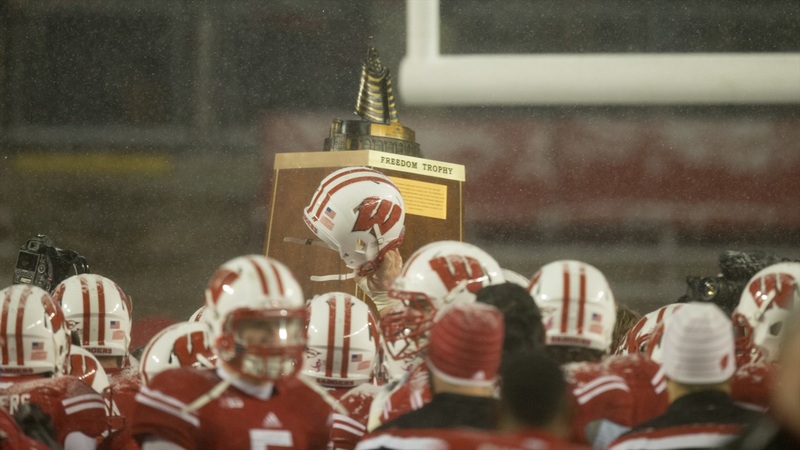 Q: What is it about Camp Randall that makes it such a tough place for an opposing team to play? JK: The game day atmosphere prior to the game, with the fans and hours' worth of tailgating, and the noise generated during each contest make it a very difficult place to play. I was up in the press box for the Ohio State game, and I've covered the team for three years -- I never felt the press box shake like it had outside of 'Jump Around.' It may have been a minor sway compared to that post-third quarter tradition that makes the press box feel like a rocking horse, but there's an energy that many stadiums in the country can't compare to. ESPN.com's Jesse Temple wrote a great piece on it a couple weeks back. Q: There seems to be some hesitation to officially call Nebraska and Wisconsin rivals. What are your thoughts on this? JK: I think rivalries take a bit of time to build up. There's a lot of respect between both programs, especially since Mike Riley and Chryst are such good friends. Some of the games since 2011 have been awfully one-sided (2011 regular season game, the 2012 Big Ten Championship game, Melvin Gordon's 408-yard performance) in the Badgers' favor, but there's been a lot on the line in many of them. Having the teams in the same division and competing every year now will only add to it, especially on Saturday with Wisconsin needing a win to stay in the West division race (and still needing the Huskers to lose one more game this season to force a tiebreaker). The Freedom Trophy is something both programs want to take back to their respective facilities. It'll continue to grow, and I'm sure this week's game will add to it for years to come.